eTrack’s Invoicing is robust, powerful and intuitive, proven over decades and used by almost all of our clients to invoice thousands of invoices a year. In just two clicks you can prepare a batch of emails with PDF invoices attached…a huge time saver! 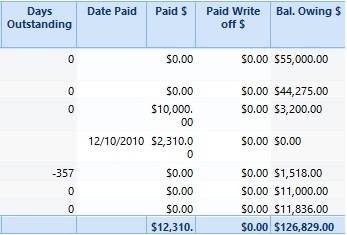 Invoices are prepared in the Accounts tab where managers view WIP and costs and decide the $ or percentage to invoice. 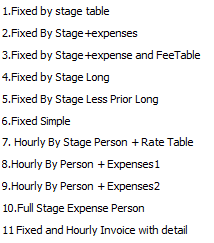 Multiple Stages and Variations can be combined into one Invoice and the details shown. Print one or more invoices to pre-defined invoice templates (see opposite for examples of standard ones we provide). You can customise these with your own logo, fonts and text or create your own to satisfy different clients. For example, you can include: time based or fixed price fees, rate tables, roles or staff, past and remaining fees by Stage, disbursement and consulting types, c/o fields, billing contacts, PO number etc. A manager can enter a textual description in eTrack to appear on the invoice and include Timesheet comments or use them as a guide. Invoice numbering is automatic and can be unique or unique within the project. Once invoices are ready and any edits have been optionally done (in Excel), clicking the Email button will convert them to PDF and attach them to emails. You can select the reply address, a template email body with mail merge, the signature, and text to add to the status bar along with the project and invoice numbers….or just press Enter to use the defaults previously set up! In a few seconds the batch of emails are presented in eTrack’s Built in Email module ready for final review, further editing to personalise or to add other attachments…. and they are already saved to your file server and filed for you! eTrack is designed to interface to your accounting system or financial management system for payroll, general ledger and tax. Account codes are defined in eTrack for Time, Tax, Consultant and Disbursement types etc and the granularity of export defined, so you do not need to change your accounting setup. eTrack has interfaced with Xero, MYOB, Quick Books, MYOB EXO, Sun Financials, Great Plains, Axiom, Navision, Peoplesoft, Adept, Delta Vision, SAP, Oracle Financials, Progen. eTrack will also track payments or receipts and days outstanding (aged debt) for the benefit of managers who do not have access to your accounting system.